Rather than standing stolidly behind laptops, controlling pre-orchestrated sets and nervously twiddling knobs, Alberto Boni and Simone Antonioni of Evil Twin are known for putting on powerful performances blending guitar, electronic instruments and atmosphere. Relocating to Berlin from Modena, Italy, the pair are drawing influence from the city’s harsh winter weather and the young creative climate. They’re constantly evolving as a music project—starting as a DJ duo in 2012, Simone’s guitar work combined with Alberto’s Ableton wizardry has created a musical force to be reckoned with. The mix Evil Twin have compiled for us is a unique sampling of atmospheric, ambient and somber tunes that are very much in line with their sound. We spoke with the pair about their approach to music. The Evil Twin project has a distinct sound already—how did that develop? How long have you been playing? Simone: I am quite adventurous in music, listening to everything from Bob Dylan and Neil Young when I was a kid to the most rude contemporary techno, indie, grunge, rock’n’roll and so on—and all that mixing of genres defined a style of music for Evil Twin that contains all of these influences. Walk us through your live set up. S: We thought that for feeling more complete with our music—and for being noticed—was important to build a show that was more than a Macbook with Ableton Live, and some controllers. Are you both working full time as musicians? S: Yes, I’m a producer, sound designer, music teacher, and label owner. You incorporate a lot of different styles in your music, who/what are your biggest influences? S: Patrick Wolf, Albert Camus, Bret Easton Ellis, Carmelo Bene, Pete Doherty and Carl Barat. Why the move to Berlin? How has the music and vibe of the city affected you and your music so far? A: I visited the city for the first time ten years ago and instantly fell in love. From there I’ve started coming to Berlin every year for a few days—trying to feed my soul and mind with everything that was going on in the city, then I decided to move here. What are your biggest hopes for your music careers? S: I would like to play a live show in Versailles during the anniversary of the French Revolution. Thank you Alberto and Simone for the moody beats, and for taking us through the development of your sound. 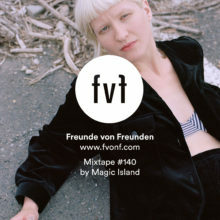 Hear more from Evil Twin here, and be sure to check our our archive of FvF Mixtapes here.